Often dubbed as ‘Norway of Arabia’, the Musandam peninsula is by far the most spectacular scenic destination in the entire Gulf region. The red rock Hajjar Mountains, with breathtaking steep fjords, cliffs and islands, embrace the emerald-green waters of the Arabian Gulf, giving Oman a touch of serene wilderness. 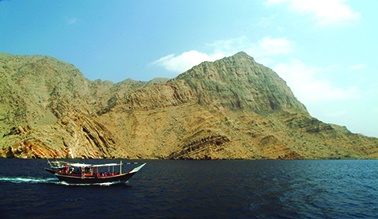 For the romantics at heart and the ones who are in for beautiful views of mountain and maritime landscapes, Musandam is a real treasure cove to explore. Therefore, if you want to broaden your horizons outside of the UAE, a delightful Musandam trip promises an adventurous yet tranquil experience. Located at a three-hour drive from Dubai, Musandam’s capital city Khasab (translated as fertility) retains its meaning in every sense -- a place blessed with date farms and an exotic marine life. So, give yourself at least one full day to explore the scenic fjords, the villages nestled amid the Hajjar Mountains, and its unparalleled splendour. The best way to get the most out of this haven is to book a cruise on a traditional open-air dhow (wooden boat). As you cruise away from the shore, you will be in for a surprise -- dolphins, basking sharks, even the whales swimming beside your dhow in full glory can actually leave you speechless. You will also see the wild uplands of the Jebel, dotted with fossils and petroglyphs. If that’s not fascinating enough, you can go snorkelling or hand-line fishing right in the middle of the sea! And if you crave for some adrenaline rush, opt for a banana boat ride instead or better still take a casual swim beside the dolphins! Moreover, if you fancy discovering the land, go for a night walk around the city to explore local sights. The must see places on an exciting Musandam trip include the Khasab Castle, supposedly built in the 17th century by the Portuguese, the Alkmazrh Fort and the Khasab Palm Groves. Fast facts: Technically, you will need to cross a border between the UAE and Oman; so there are a few legalities you must consider for your trip to Musandam Khasab: * Every person must have their original passports with them. If you are a UAE resident, you should have your national ID card with you, too. * Your passport will be stamped both at the exit out of the UAE and at the entrance to Oman and vice versa on your way back. * For entry to Khasab, you require a visa (given on the spot, at the border). Citizens of Australia, European Union, USA, New Zealand, Japan and certain other nationalities can apply for a visa at the border. * Different regulations apply depending on your nationality and whether you are in the UAE as a tourist or as a resident. * The visa fee is Dh85 (subject to change). * Be aware that the Omani Government often changes its rules to enter the territory without notice.